ZIIIRO Celeste Watch | Nerd Much? Forget about the ridiculous Apple Watches — smartwatches are redundant, anyway. Actually, watches, in general, are pretty much useless nowadays, unless you’re only sporting one for the look. If that’s the case, check out the ZIIIRO Celeste Watch (that’s three I’s for those keeping score at home), a watch that is one of the most unique timepieces on the planet. In fact, we’re not even sure if it’s from our planet at all. It uses transparent colored discs to tell the time and the minute. 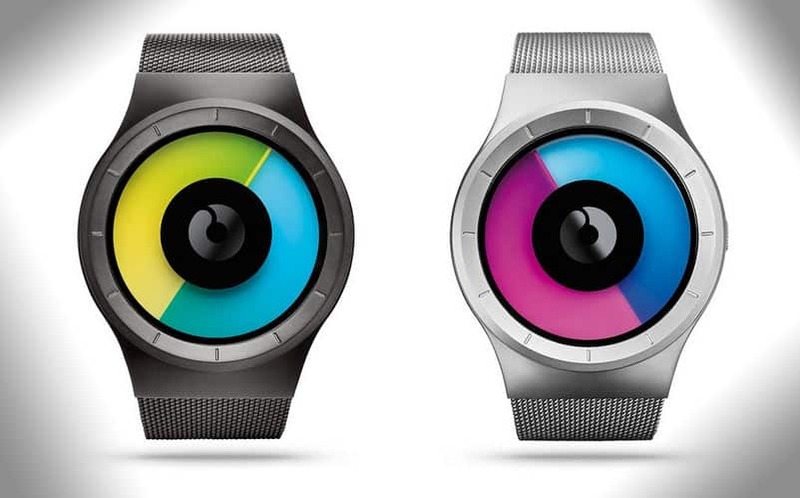 There are two colors on the watch’s face (colors vary depending on which design you choose). There are five styles available, including Gunmetal Colored, Gunmetal Mono, Colored Chrome Mesh, Chrome Purple, and Black Mono. The ZIIIRO Celeste Watch is a watch you can wear every day without worrying about breaking it, and you’ll never doubt your cool while you’re wearing it. Pricing starts at $129.99.